Science surrounds me. Everywhere I look people are practicing the skills I’ve been teaching for the past twelve years. Today, I am practicing the skills of observation and documentation. The following are my observations of hydrography in action. 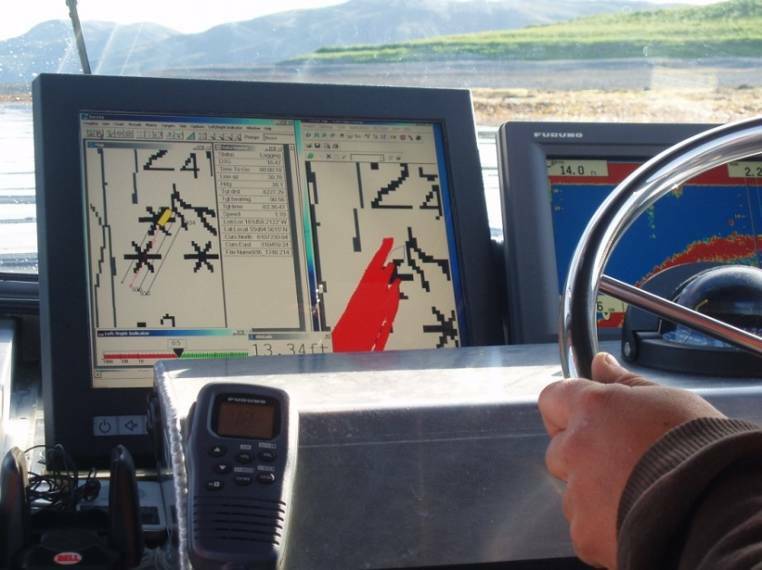 Hydrographic survey or Hydrography: the measurement and description of the sea bed and coastal area. These data are used to produce navigation charts. 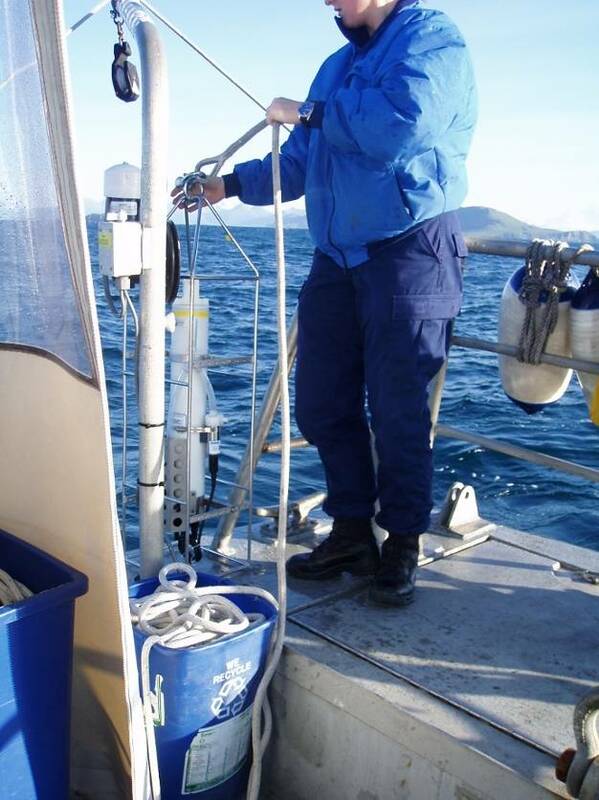 CTD and CTD cast: “CTD” is the abbreviated name for an instrument package that has sensors for measuring the Conductivity, Temperature and Depth of seawater. The instrument is lowered to the bottom. It collects Conductivity, Temperature, Depth and density data for the entire water column. That data is used to make corrections in the hydrographic survey data. Multibeam sonar: By measuring the time it takes for sound waves sent from a transmitter mounted beneath the launch to bounce back, scientists determine the depth to the seafloor. Multibeam sonar systems provide fanshaped coverage of the seafloor. Because the speed of sound in water is related to conductivity, temperature and depth the CTD data is used with the multibeam sonar data. The day starts at 0800 (8:00 am) on the fantail (rear, lowermost deck of the ship) with updates, detailed weather forecasts for the areas that will be mapped, and instructions from the Commanding Officer (CO), Executive Officer (XO), and Field Operations Officer (FOO). Then, wearing flotation devices and hardhats, each crew assembles to board the launches. As each launch is lowered, it is stopped even with the deck, and its crew of at least three, two hydrographers and a driver, boards. A cooler and thermoses for lunch are handed over. The launch is lowered into the water on cables and unhooked from the ship. It speeds at about 15 knots to the area to be mapped. The survey begins with a CTD cast. The CTD is lowered to the seafloor to collect data on water conductivity, temperature and depth. It is necessary to conduct a CTD scan every four hours or whenever conditions change. For example, if the launch moves to deeper water or to a different area. That done, the crew engages the multibeam echo sounder system, and at 7 knots per hour, the launch begins collecting data,“mowing the ocean.” In order to completely map the assigned seafloor area, the launch ends up making a pattern very similar to the back and forth pattern made by a lawnmower. This sounds easy enough, but it takes about a year to really learn the job. Each launch needs a three man crew. The Coxswain drives the launch and keeps the towed equipment on the grid line no matter what the seas around are doing. The two hydrographers take turns scanning and tweaking four computer screens that are monitoring data collection. The towed instruments are collecting real time data that has to be checked and stored. All of this work is conducted in a relatively small boat, in the open ocean. When you add that component, you quickly realize that this is not only exciting science by a true adventure at sea. These crews are highly trained professionals. The launch drivers are senior members of the Deck Crew and are very experienced mariners. So far, I have worked with a ferry driver, a commercial fisherman, and an outward bound instructor. I tried driving the launch for a little while on my first day out. With no experience at all, I found it quite difficult to keep the launch headed along the line. Any deviation of the towed instruments from their prescribed grid path causes missed spots called “holidays.” “Holidays” can be caused by other things as well such as unexpected software crashes or gaps caused when data points have to be removed during processing. For complete survey coverage, the launches must return to remap “holidays.” These are therefore holidays for the equipment not the hydrographers. The second full day at sea we continued our transit to the survey area. Bright sunshine ignited an endless parade of snowy volcanoes. Off the bow, whale spouts dotted the horizon, and puffins bobbed and clumsily took off flashing their orange feet like small flags. At 2100 (9:00 pm), with the day still bright, nearly everyone gathered as the ship dropped anchor in a small bay at what appeared to be the end of the world. 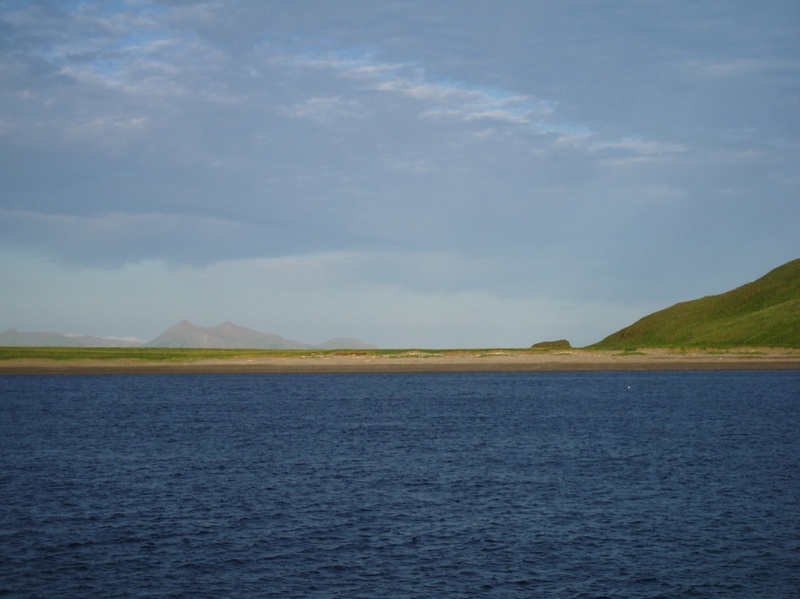 Two smooth, lawn-green islands connected by an isthmus marked the boundary. Beyond, on a hazy, distant horizon were the outlines of volcanoes. 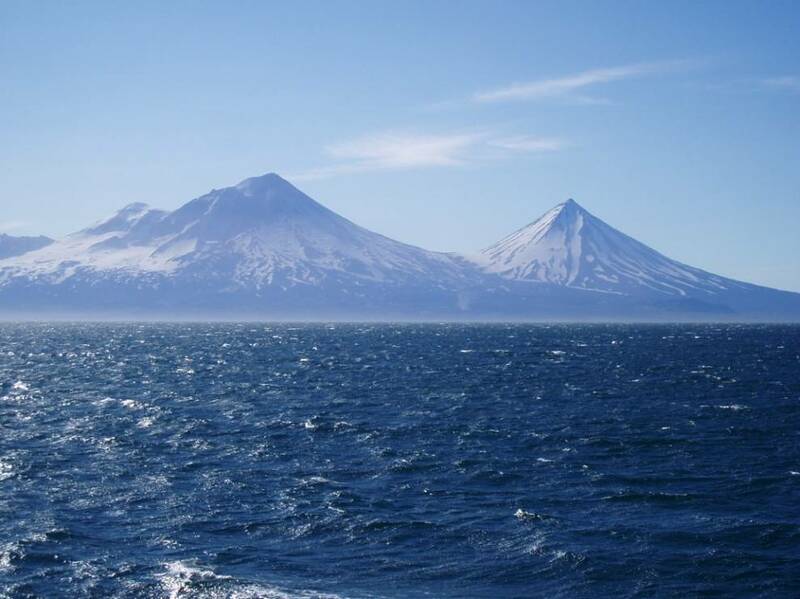 Behind, loomed the pointed, snowy Pavlof volcanic peaks. Perhaps Robert Frost was right. 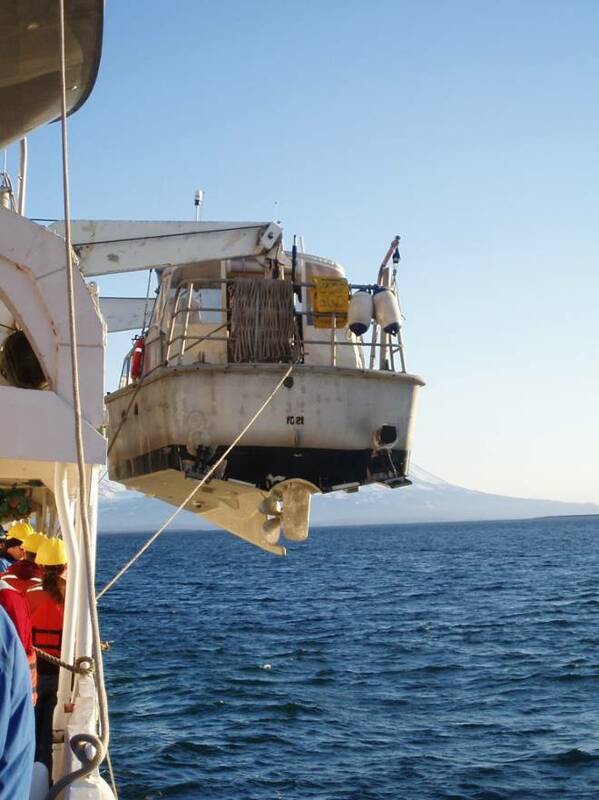 This entry was posted in 2008, Lisa Hjelm, NOAA Ocean Service, NOAA Teacher at Sea and tagged Alaska, CTD, Hydrographic survey, launch, multibeam sonar, noaa ship rainier, pavlov islands. Bookmark the permalink.